Devices are enrolled to a provisioning service instance by creating an Enrollment group, or an Individual enrollment. This quickstart shows how to use Python to programmatically create an Enrollment group that uses intermediate or root CA X.509 certificates. An enrollment group controls access to the provisioning service for devices that share a common signing certificate in their certificate chain. The enrollment group is created using the Python Provisioning Service SDK and a sample Python application. Creating Individual enrollments using the Python Provisioning Service SDK is still a work in progress. To learn more, see Controlling device access to the provisioning service with X.509 certificates. For more information about using X.509 certificate-based Public Key Infrastructure (PKI) with Azure IoT Hub and Device Provisioning Service, see X.509 CA certificate security overview. This quickstart expects you have already created an IoT hub and Device Provisioning Service instance. If you have not already created these resources, complete the Set up IoT Hub Device Provisioning Service with the Azure portal quickstart before proceeding with this article. Although the steps in this article work on both Windows and Linux machines, this article is developed for a Windows development machine. Install Python 2.x or 3.x. Make sure to use the 32-bit or 64-bit installation as required by your setup. When prompted during the installation, make sure to add Python to your platform-specific environment variables. Install or upgrade pip, the Python package management system. For this quickstart, you must have a .pem or a .cer file that contains the public portion of an intermediate or root CA X.509 certificate. This certificate must be uploaded to your provisioning service, and verified by the service. The Azure IoT C SDK contains test tooling that can help you create an X.509 certificate chain, upload a root or intermediate certificate from that chain, and perform proof-of-possession with the service to verify the certificate. Certificates created with the SDK tooling are designed to use for development testing only. These certificates must not be used in production. They contain hard-coded passwords ("1234") that expire after 30 days. To learn about obtaining certificates suitable for production use, see How to get an X.509 CA certificate in the Azure IoT Hub documentation. You should expect this operation to take several minutes to complete. The test tooling is located in the azure-iot-sdk-c/tools/CACertificates of the repository you cloned. Follow the steps in Managing test CA certificates for samples and tutorials. This section shows how to add the provisioning details of your X.509 device to the sample code. Using a text editor, create a new EnrollmentGroup.py file. Add the following import statements and variables at the start of the EnrollmentGroup.py file. Then replace dpsConnectionString with your connection string found under Shared access policies in your Device Provisioning Service on the Azure portal. Replace the certificate placeholder with the certificate created previously in Prepare test certificates. Finally, create a unique registrationid and be sure that it only consists of lower-case alphanumerics and hyphens. Save and close the EnrollmentGroup.py file. Open a command prompt, and run the following command to install the azure-iot-provisioning-device-client. In the command prompt, and run the script. Observe the output for the successful enrollment. Navigate to your provisioning service in the Azure portal. Click Manage enrollments. Notice that your group of X.509 devices appears under the Enrollment Groups tab, with the name registrationid created earlier. If you plan to explore the Java service sample, do not clean up the resources created in this Quickstart. If you do not plan to continue, use the following steps to delete all resources created by this Quickstart. Close the Java sample output window on your machine. Close the X509 Cert Generator window on your machine. 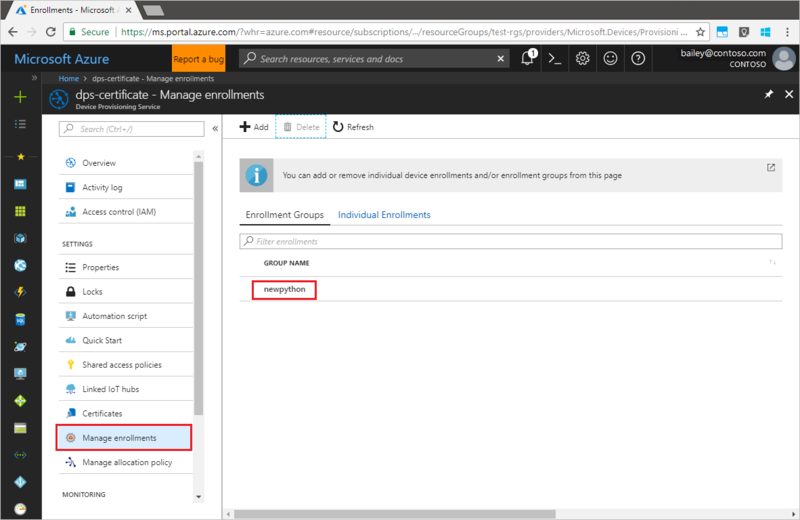 Navigate to your Device Provisioning service in the Azure portal, click Manage enrollments, and then select the Enrollment Groups tab. Select the GROUP NAME for the X.509 devices you enrolled using this Quickstart, and click the Delete button at the top of the blade. In this Quickstart, you enrolled a simulated group of X.509 devices to your Device Provisioning service. To learn about device provisioning in depth, continue to the tutorial for the Device Provisioning Service setup in the Azure portal.